Northern Victoria is so flat that it takes a few days for the water released from Lake Eildon to reach the brand-new, laser-contoured Goulburn-Murray irrigation canal where Dudley Bryant lives and farms. Bryant is 58 years old, born and raised in northern Victoria on a farm near Shepparton started by his father, one of the “soldier-settlers” given land and water rights by the government after World War Two. 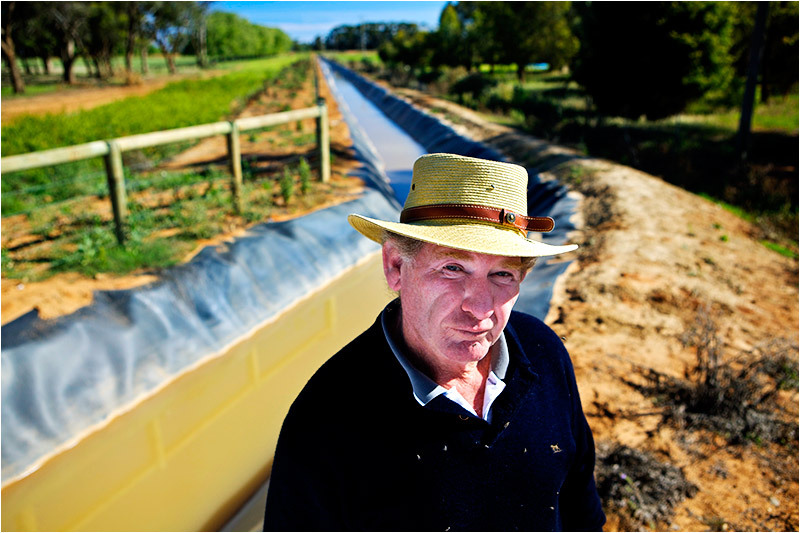 Until 2004, when he helped to found Northern Victoria Irrigators, Inc., a 1,200-member growers organization focused on upgrading irrigated agriculture in one of the foremost dairy and forage growing regions in Australia, Bryant – who also became the organization’s president – was widely known as a capable, conservative, take-no-crap-from-anybody cattle producer with the capacity to consume prodigious amounts of beer. Now he’s a player in the ordeal that is Victoria’s water politics, which of late has grown increasingly demanding. And that’s saying something in the Murray-Darling River Basin, a region that fully understands how much every drop of water counts, having been in the water management business since the early 1880s, when a long drought first prompted farmers and business leaders to build the canals fed by the Goulburn and Murray rivers, that later became the Goulburn-Murray irrigation district. Behind Bryant is the newest canal in the 4,100-mile district. Unlike the weedy, deep, wide and ill-kempt canal on the other side of the road, the new canal is straight as a rifle shot, clean as a dance floor, and lined in white rock and clay. Not far away is a similar canal with a thick rubber liner. Both bottoms serve the same purpose: to prevent seepage. Dudley Bryant, a cattle producer near Shepparton and a key voice in water politics, started Northern Victoria Irrigators, a farmers’ group that is supporting a US$1.5 billion project to modernize the leaky Goulburn-Murray irrigation district (click image to enlarge). Intermittently, little iron and concrete bridges cross the new canals. They support steel gates and remote-controlled, solar-powered digital switches that operate electric motors to move the gates up and down. The channels and the computerized control system are features of the largest irrigation modernization program in the world, designed to save energy, improve efficiency, and prevent billions of gallons of water from being wasted each month. Indeed, more than half of the Goulburn-Murray canals were built before 1930. Their bottoms are so porous that as much as 40 percent of the water they are supposed to carry from reservoirs to the roots of crops never arrives. The manual gates and water gauges of the old channel control system wasted even more water. The Goulburn-Murray irrigation district accounts for nearly 90 percent of all the irrigation water used in Victoria. And irrigation uses almost 80 percent of all the water in Victoria. Put simply, the Goulburn-Murray district wastes roughly 1,000 gigaliters of water each year, or about the same as everybody outside the district, including all of Melbourne, actually used. In Australia, says Bryant, droughts aren’t just a caprice of nature. They are a catalyst for investment, engineering, entrepreneurism, new policy and economic development focused on storing and moving water. For over a century, the basic narrative of that story was how capital, engineering and technology converged to direct more of the Murray Valley’s water to the roots of northern Victoria’s crops. In Australia, says Bryant, droughts aren’t just a caprice of nature. They are a catalyst for investment, engineering, entrepreneurism, new policy and economic development focused on storing and moving water. In simple economic terms, it worked. Irrigated agriculture generates farm income of $9 billion a year in Victoria, and exports total $2 billion annually, much of it from dairy production. The Goulburn-Murray district by itself produces 26 percent of Australia’s milk. But the competition for northern Victoria’s water also prompted other players to join the fray. Naturalists and conservationists called for more water to be directed to preserving the environment and rebuilding fisheries and restoring wetlands. Adelaide and Melbourne needed water. Farmers were coming under attack for wasteful planting practices. In 2004, when Bryant became a public figure, a serious proposal was taking shape to do something never before seriously considered in the 125-year history of irrigation in Victoria: investing in new infrastructure and equipment that would direct water away from agriculture. But as outlandish as that idea initially appeared to Bryant, he and his organization ended up helping to broker and defend the $1.5 billion Northern Victoria Irrigation Renewal Project – paid for by Melbourne, Victoria, the federal government and farmers – to modernize the leaky, water-wasting Goulburn-Murray irrigation district. For all of its challenges, the 12-year drought distilled the central cultural and economic dilemma facing Victoria this century: redistributing a diminishing supply of fresh water. The lessons learned in drafting the agreement and executing the water-saving plan has ramifications for other regions where cities are competing for water with farm districts. The southern reaches of Victoria are dominated by Melbourne, one of the fastest-growing big cities in the world, where 3.8 million people live now and as many as 8 million people could live by 2056, according to projections by the Australian Bureau of Statistics. Meanwhile 70 percent of Victoria’s water is stored by the Goulburn-Murray irrigation district, the center of the slower-growing northern part of the state, where 1.4 million people live. Since 1886, the Irrigation Act has established the government’s ownership of the “use and control of the flow” in all of Victoria’s rivers and streams and has provided the State of Victoria the authority to allocate water rights to cities, industry and irrigators. Translation: Water is controlled by government, making is availability, use and distribution a function of politics and power. Which is where Dudley Bryant fits in. As the current drought tightened its grip on Victoria, Melbourne’s water supply grew short. Stage-three restrictions were put in place to encourage conservation and discourage waste. City and state leaders also developed a plan to spend $4 billion, 60 percent of which was allocated to build the world’s largest desalinization plant south of the city to turn sea water into drinking water. But the city and the state also agreed to spend the balance to coax farmers in northern Victoria to reconsider their options. Since 1996, Australian farmers have been able to sell and trade their water rights on the open market. Last year, water sold for more than $1,000 a megaliter in parts of Victoria and New South Wales (two megaliters is equivalent to the water needed to fill an Olympic-size swimming pool). 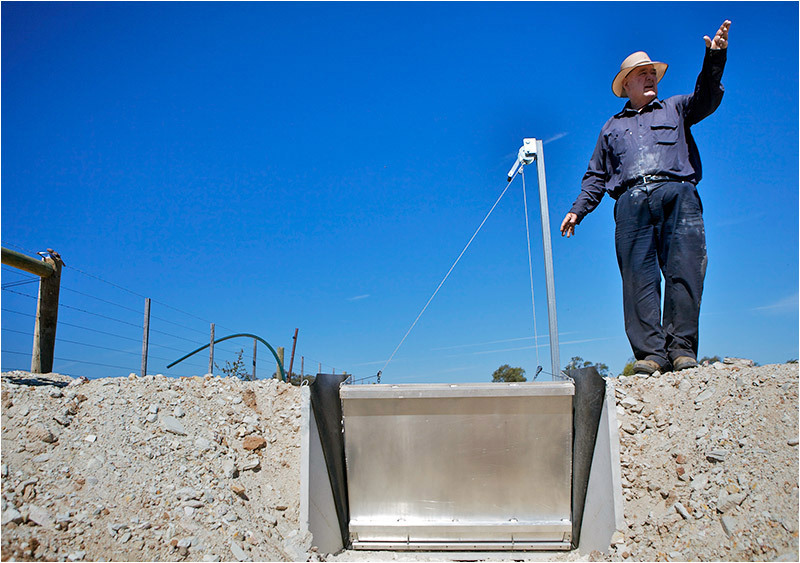 A typical farmer in Victoria owns the right to 400 megaliters or more. The math is easy. Farmers facing ruin because of the drought could cash out and generate a nice little nest egg. Melbourne residents and authorities, moreover, were capable of buying lots of water rights. And if they did, the prospects for a thriving farming economy and culture in and around Shepparton would diminish. “It was a way out for us,” says Bill Gread, a dairy producer who helped bolster Bryant’s case. “The way we were going, we were going to lose everything.” (click image to enlarge). When he first heard of the proposal, Bryant said he joined his neighbors in opposition. But as he thought about it, the plan made sense. In a water-scarce era that scientists believe is now the norm in the Murray-Darling Basin, investing in the irrigation system would save a lot of water. And farmers would get a third of the savings. In public meetings, Bryant said just that and was routinely condemned by friends, though as time went by, he also found support. When it’s completed over the next decade, the project will largely prevent seepage and waste, and improve the efficiency and profitability of the more than 14,000 farms that rely on the irrigation district for water. That’s the part of the plan that many farmers, facing increasing costs and competition for water, really liked. In return for rebuilding the irrigation network, Melbourne gains a third of the 225 gigaliters that will be saved. The city is building a 46-mile pipeline to take its share of water from the Goulburn River, pump it over highlands, and store it in the Sugarloaf Reservoir nearer to Melbourne. The $500 million project, approved in 2007, has attracted enormous political opposition. Environmental groups, many farmers, and elected leaders have marched on Parliament, held boisterous public meetings, and staged actions to stop the construction. They say the pipeline is damaging sensitive forest land and that the water should stay in northern Victoria, where it’s most needed. The federal and state government officials, meanwhile, assert that a third of the water saved by the irrigation modernization will be released to the river for environmental restoration. Farmers will receive the other third. Keith Schneider, a former New York Times national correspondent, is senior editor and producer at Circle of Blue. J. Carl Ganter, an award-winning photojournalist, writer and broadcast reporter, is the co-founder and director of Circle of Blue. Contact Keith Schneider or contact Ganter at carl.ganter@circleofblue.org. For a complete list of credits, acknowledgments and other resources related to Circle of Blue’s coverage of “The Biggest Dry” please click here. That’s absolutely mind-boggling how so many people can benefit from a few tweaks to one of man’s oldest inventions. Bravo!